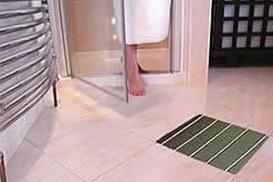 Underfloor heating systems can be installed under most types of flooring. They’re also quick to fit, maintenance free and completely silent to run, for hassle-free warmth underfoot during those cold winter months. Use a simple programmable timer or a floor-sensing thermostat to set the temperature and you’ll never have cold toes at home again! Whether you’re thinking of installing underfloor heating in the kitchen, bathroom, conservatory or throughout your entire home, this is a flexible heating solution that can be used under tile, stone, wood and laminate flooring and avoids unsightly radiators or heaters. The real beauty of underfloor heating however, is that you can install it yourself! Not only does underfloor heating look better – or rather, it can’t be seen at all – so that your decor isn’t ruined and your wall space isn’t used up, it also has a range of other benefits over traditional radiator based heating systems. Firstly, where large warm surfaces such as a heated floor exist, homeowners will find it possible to achieve comfortable living conditions with cooler air temperatures, leading to increased energy efficiency. Your home will feel fresher and less excess heat energy will be lost, reducing your energy bills as well as your carbon footprint. Plus, the radiant heat from underfloor heating will drastically reduce the constant air circulation of traditional radiator or electric heating systems, reducing cold drafts and dust in the atmosphere! 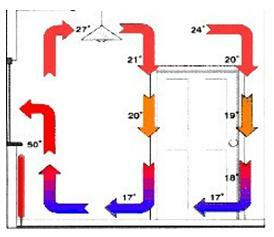 Wall radiators create excess air movement as the air constantly rises and falls as it changes temperature, leading to cold draughts. 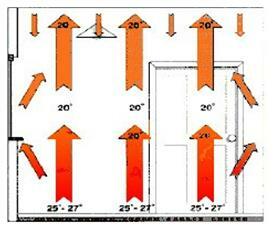 Underfloor heating generates warmth where it is needed, not at ceiling height. There are two factors that influence whether the temperature conditions in your home are comfortable or not. Firstly, there is the ambient air temperature and secondly, there is the average radiant surface temperature. It’s more comfortable being in a room with a constant and evenly distributed temperature than it is to have a single high-temperature heat source such as a radiator in one area of the room. Ideally you want temperatures to be warmer at floor level than head level - 22°C (72°F) vs. 19°C (66°F) – which underfloor heating helps to achieve. Is a Lower Output More Energy Efficient? A higher output doesn’t necessarily mean higher running costs, it just means that the desired temperature can be achieved faster. 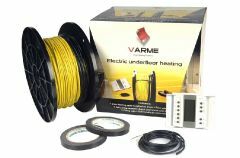 High quality underfloor heating kits such as those sold at Alert Electrical can be used with a sophisticated digital thermostat to delivery just enough power once the desired temperature is achieved to maintain it. Are Single or Twin Core Cables Better? Twin core cables are preferable for a number of reasons. These cables have two heating elements inside rather than one which means you only have one end to connect to the power supply which is very advantageous during the installation stage. The electromagnetic field created by electrical appliances is also dramatically reduced where twin core cables are used, to a level that is almost immeasurable. A cable mat will help you to cover a large surface area quickly and easily, however the cable kit is better suited to small rooms of those with awkward positions where laying the mat out could cause problems. Insulation is essential to maximise the efficiency of any heating system, and this includes underfloor heating, especially where the non-heated temperature is very low such as in a conservatory. If floor height allows, use a tile backer board with a thickness of 6mm to 60mm depending on the level of insulation required. These are affixed to your existing floor surface before laying the underfloor heating. If you do not have the space to install tile backer boards, use an insulating primer that is ‘painted’ onto the floor. One or two layers of Depron are recommended. Conservatories are one of the most common locations for underfloor heating to be installed as they are typically much cooler than the rest of the house. However, we do recommend additional insulation. If your conservatory floor is tiled, use a tile-backer board 10-50mm thick followed by a 150w/square meter output heating kit. For wood or laminate conservatory floors, use a 160w carbon film underfloor heating kit, and a 2nd layer of Depron if installing on an un-insulated floor.